The art and science of reefkeeping continues its steady progression with introductions of equipment that we only dreamed about in the hobby’s early days. Early on, it was recognized that lighting was critical while water motion received relatively little attention. Since the reef hobby was such a tiny fraction of the aquarium trade, few manufacturers were catering to the needs of reefers so hobbyists were forced to improvise. Serious hobbyists were handcrafting dump buckets and siphon-based Carlson Surge Devices. One dedicated aquarist, Jimmy Chen, modified a Little Giant™ pump by adding a model boat propeller. This ingenious concept would have far-reaching ramifications and eventually revolutionized the way we move water in reef aquaria. After years of sitting on the sidelines, Marineland finally decided to get into the propeller pump business and now offers Maxi-Jets in three configurations: Propeller Pump, Powerhead, and Utility Pump, all available in a single package marketed under the name of Maxi-Jet Pro. These new designs and configurations call for another in-depth look at their performance. How will the New Maxi-Jets compare against the old? Marineland Aquarium Products’ Maxi-Jet pumps have been around for quite some time. These pumps, with their epoxy-encapsulated motors proved to be highly reliable and became workhorses within the hobby. Recently, their design changed as well as their country of manufacture. The original Maxi-Jets were imported from Italy; they are now made in the Peoples’ Republic of China. Although similar in appearance, the new pumps are slightly different and parts are not interchangeable between the new and old designs. The manufacturer promises relatively high performance while offering them at very modest prices. Is this a case of ‘you get what you pay for’ or are they a true value? How much water pumps move is often a prime factor when considering a purchase. Tests were performed according to methods listing in Testing Protocols (below). How do these pumps’ advertised flow rates stack? See Figures 1, 2, and 3. 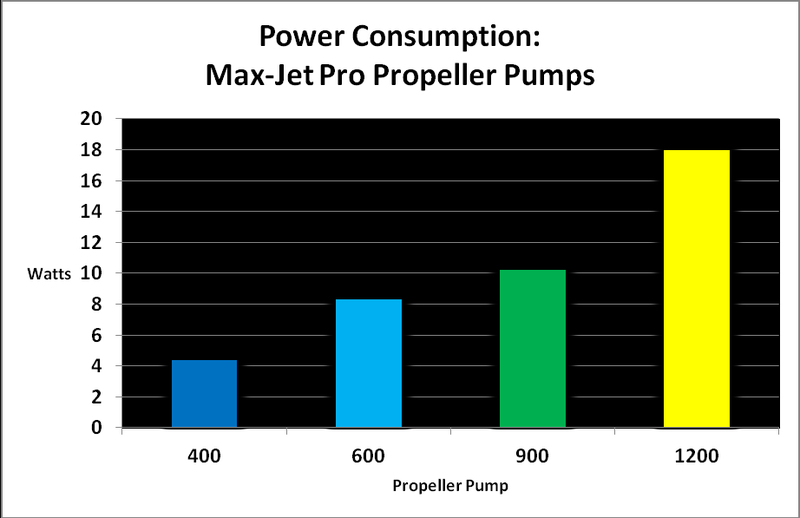 Figure 1.The ‘new’ Maxi-Jet models 400, 600, and 900 powerheads pump more water than advertised. The 1200 pumps almost exactly what the manufacturer claims. Figure 2.The ‘new’ models 600, 900, and 1200 Maxi-Jets pump more than the older design. 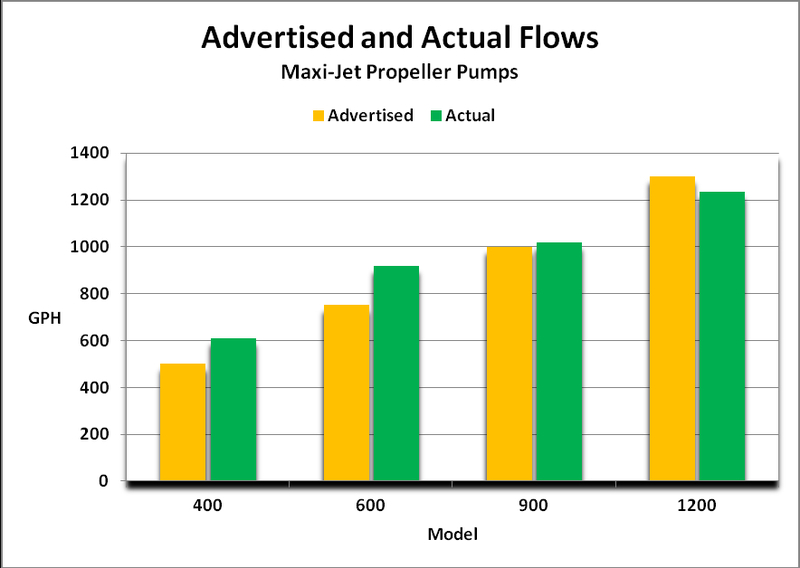 Figure 3.Advertised flows were exceeded by all models except for the Maxi-Jet 1200. The weakening (attenuation) of flow over distance is an important, but often overlooked, concern. Simply looking at the number of gallons pumped per hour or discharge velocities fails to tell the whole story. Knowing at what distance the flow drops below a certain point is valuable information when decided how many pumps to use. On a natural coral reef here in Hawaii, flow velocity is normally about 4 inches (0.25 feet) per second, hence we’ll use that figure as a cutoff point. 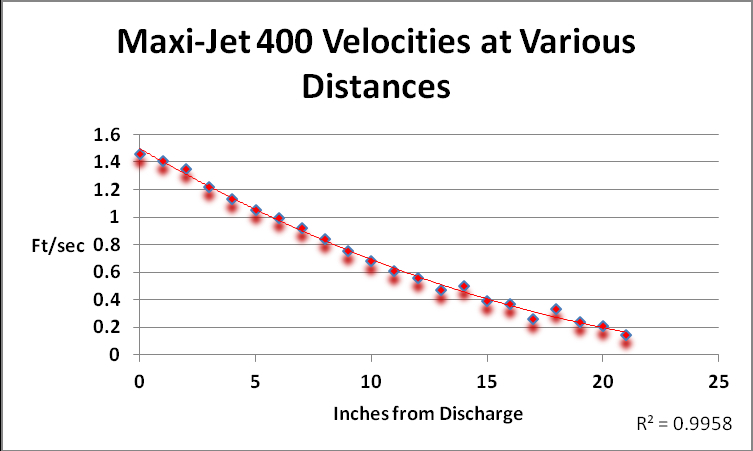 As Figure 4 shows, flow velocity drops below 4 inches per second at a distance of about 17-18 inches from the Maxi-Jet 400 pump’s discharge. Figure 4. Flow velocities as a function of distance. 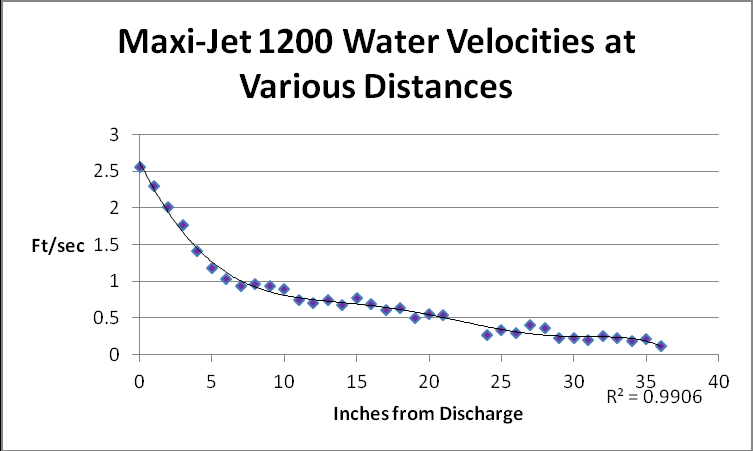 Figure 5 shows us a Maxi-Jet 1200 propeller pump can push water at a velocity of 4 inches per second about 24 inches from the pump’s discharge. Figure 5. Velocity attenuation of the maxi-Jet 1200 propeller pump. Reefkeeping is not known as a particularly inexpensive hobby. After initial setup and livestock purchases, there are monthly maintenance costs to consider. Power consumption is usually tops the list of routine expenses. See Figures 6 and 7. Figure 6. See comments on power consumption in the ‘Comments’ section below. Figure 7. 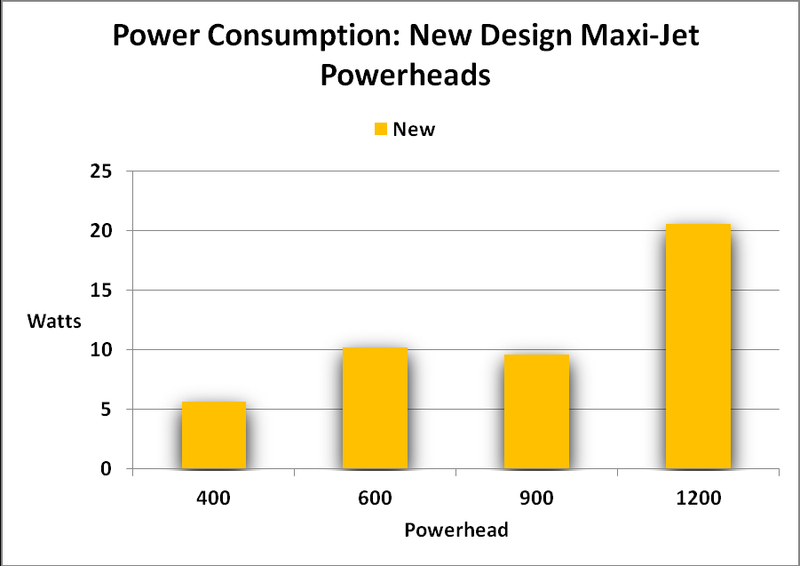 Power consumption of Maxi-Jet’s four models. The new Maxi-Jet powerheads (made in China) draw more power than the old powerheads (Italian made). See Figure 8. Figure 8. 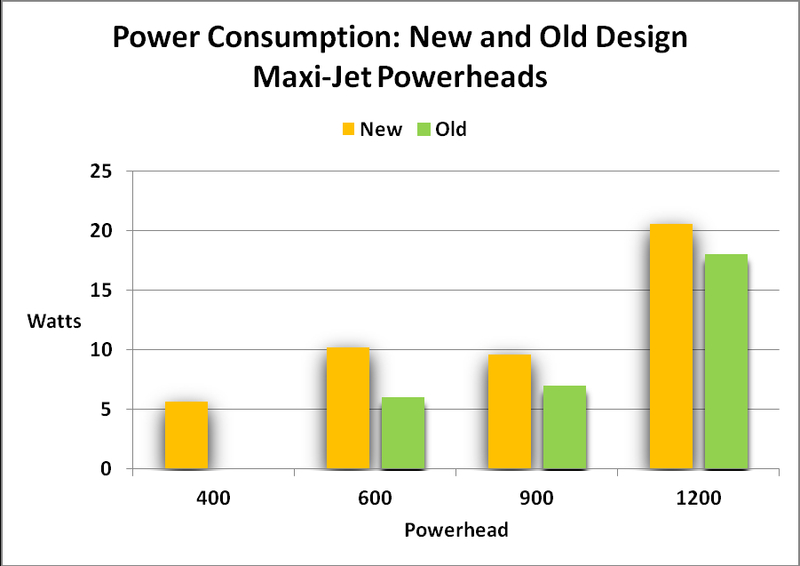 Power consumption of the new and old Maxi-Jets. Power consumption is only part of the story. To be objective, efficiency must be estimated. In order to do this, amount of water pumped was divided by watts. See Figure 9. Figure 9. 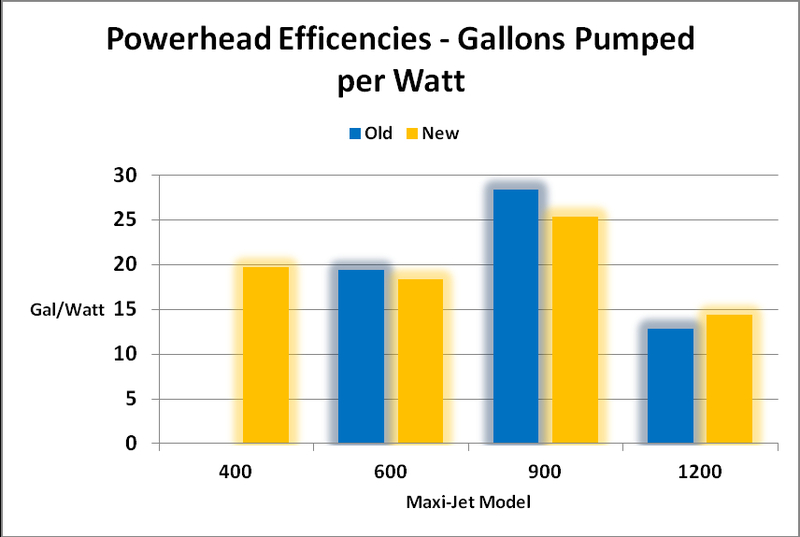 New and Old Powerhead Efficiencies. The ‘old’ Maxi-Jet 400 powerhead was not tested. The Maxi-Jet Pro box comes packed with various pieces for the three different pump configurations. One of these – a mount with suction cups – can be used with all three. When used to mount the pump to the floor of an aquarium, it will work just fine. Using the suction cups on a vertical surface is a different story. It is only a matter of time before the suction cups lose their grip and allow the pump to fall. Another piece included is a hanger with articulated joint called an omni-directional mount. I found the ball-and-socket friction fit to be sloppy and it would not keep the pump in position. There is an inexpensive fix – once the desired position is determined, a drop of Super Glue on the ball-and-socket joint will weld it in place. I would personally prefer that the new joints were as tight as the old ones. Obviously a flexible joint allows a lot of latitude. The new Maxi-Jet omni-directional holder design is compatible with Sure Grip magnets. The magnets are expensive relative to the cost of the pump, they’re a good investment considering the investment you’ve got in livestock. Maxi-Jet pumps operate on alternating current (AC) and this presents some engineering challenges for the propeller pumps. The propeller must spin in the proper direction to push flow into the aquarium. This is a problem with alternating current – at start up, the prop may or may not spin in the correct rotation. To overcome this issue, engineers have incorporated a ratchet-like device at the end of the propeller’s axial shaft. If the prop turns the wrong way, it pushes itself into this ratchet stop and once movement is arrested, it should start to spin correctly and pushes itself away from the stop device. Simple and usually effective but there is a downside – when the prop engages the stop, it makes a chattering noise until it begins to rotate correctly. This is one of the reasons why propeller pumps operating on alternating current are not recommended for use with wavemakers (there is also the possibility of damage to the prop assembly). Noise is not much of an issue when the Maxi-Jet is used in the powerhead or utility pump configurations. The impeller can spin in either direction and still push water. Powerheads can be used on wavemakers. As mentioned, the propeller volute is held on the motor housing by friction fit. There is a chance that vibration will make a low humming noise if the volute is not properly fitted to the housing. Are New & Old Parts Interchangeable? No. Parts of the old and new design are not interchangeable. Any post-market propeller modifications will not work with the new design. The four pumps examined here have a cord length of 72 inches (~1.83 meters). Although this detail may seem trivial, it is not. Generous cord lengths (as we have here) are a plus when used with larger aquaria or when dealing with distant power outlets. It is especially important in making ‘drip loops’ to prevent water from migrating to an electrical outlet. Price. If you can’t afford these pumps, you should consider a hobby other than reefkeeping. Flexibility. These pumps can meet many demands – they can run reactors, small skimmers, and can mix smaller batches of artificial seawater, plus move enough water in smaller reef tanks. Marineland’s advertising claims generally underestimate their products’ performances. 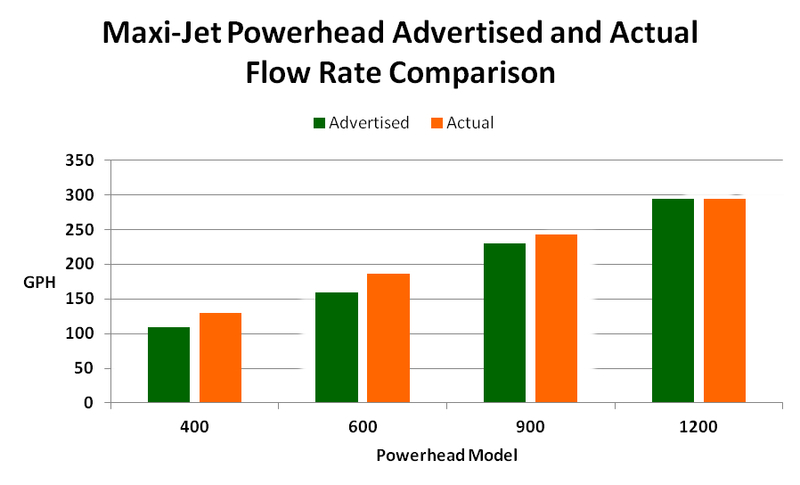 The 400, 600, and 900 powerhead models exceed advertised pump rate claims and the 1200 almost exactly matches their flow estimate. These new models pump more than the older Italian-made units so it is not surprising that these ‘new’ Maxi-Jets consume more power. The propeller pumps also exceed the amount of water pumped as claimed by the manufacturer. These pumps are listed by Underwriter’s Laboratories. The new 1200 powerhead is more energy efficient than the older (Italian) model. Mounting hardware is compatible with at least one post-market magnet (such as Sure Grip). The friction fit of the omni-directional mount is sloppy and does not hold the powerhead/prop pump in position. Although a fix is simple (a drop of Super Glue will fix the mount in place), I’d rather see tighter tolerances to allow on-going latitude in positioning. The shroud for the propeller pump must be carefully placed to allow proper alignment with the propeller assembly’s axial shaft. There will be vibration if there is a lot of misalignment. I have heard reports of the propeller housing coming loose and ‘blowing off’. I didn’t see this during testing and feel the friction fit of the housing to the pump motor is enough to hold it in place. It is possible that misalignment and resulting vibration could be to blame for the housing coming off. If misalignment is relatively minor, no vibration is apparent and it’s possible that flow output will be reduced. I had problems getting proper alignment on the 1200 and reduced flow was not apparent unless I checked the power draw with a watt meter, or determined flow velocity with an electronic water velocity meter. Suction cup mount for vertical surfaces. These invariably become detached. The new 600 and 900 model powerheads are less energy efficient than the older model powerheads. No foam covers to keep foreign particles from entering the prop pumps are offered. Based on flow attenuation data presented above, two or more of the propeller pumps should be adequate for smaller reef aquaria (up to ~20 gallons). More should be used for larger tanks. Do not use the propeller pumps with fishes that ‘pick’ such as Chelmon butterflies (or any of the longnose butterflies) – they whirling motion of the moving prop attracts their attention. Disaster awaits when their snouts meet the propeller. These pumps are not perfect and the propeller versions suffer from some design issues, however, they perform as advertised or better, and the price makes them attractive to budget-minded hobbyists sensitive to the cost of the pump. 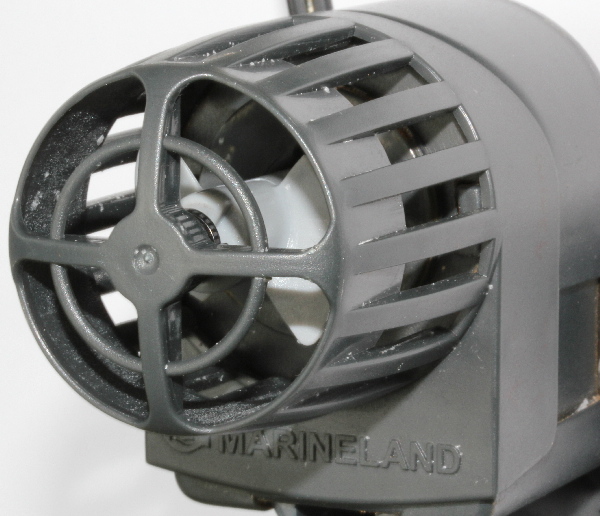 Marineland Aquarium Products warranties these pumps for 2 years after date of purchase, and will repair or replace defective parts at their option. See www.marineland.com for details. All pumps were tested in a 240-gallon test tank (8’x2’x2′) filled with saltwater at a specific gravity of 1.025. Water velocity was measured with an electronic water velocity meter (FloMate 2000 made by Marsh-McBirney, Frederick, Maryland, USA). Velocity was plugged into this formula (Flow=Velocity x Area) in order to determine flow rate of gallons per hour. 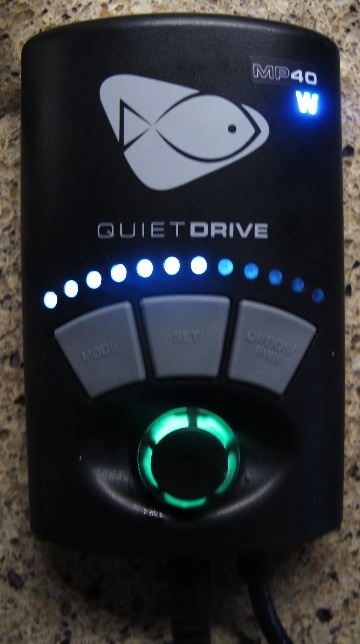 Electricity consumption was monitored by a Kill-A-Watt power meter made by P3, International.